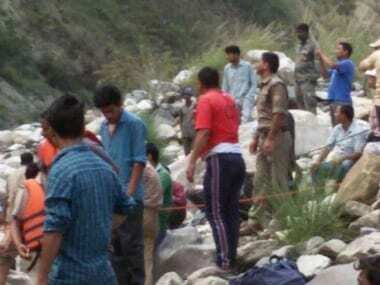 Uttarkashi: The death toll in the bus accident near Nalupani in the district has mounted to 24 after three more bodies were recovered from the mangled remains of the vehicle which fell into Bhagirathi river. Twenty bodies were recovered from the spot late on Tuesday while an injured person succumbed to injuries later at the hospital. Three more bodies were recovered on Wednesday taking the toll to 24, Uttarkashi District Magistrate Ashish Shrivastava said. Six persons who had sustained injuries in the mishap have been referred to a higher centre, he said. However, rescue efforts are still on, in case there are more bodies trapped in the vehicle which was badly damaged after falling about 300 metres down the road into Bhagirathi, the official said. The accident took place last evening when the bus carrying pilgrims from Gangotri fell into Bhagirathi river, while it was on its way to Haridwar. The bus was scheduled to go to Kedarnath from Haridwar. The pilgrims were from Madhya Pradesh. The bodies have been handed over to the kin of the deceased, the DM said. Chief Minister Trivendra Singh Rawat has expressed grief over the loss of lives in the accident and announced a compensation of Rs one lakh to the next of kin of the deceased and Rs 50,000 to those who sustained injuries.